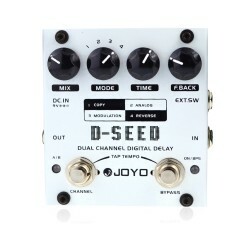 The Joyo Vision is a tone benders modulation pedal, 2 channels of modulation in one guitar effect pedal. Its two sides of modulation are built in an A and B channel that you can mix and blend in parallel or series modes at the flick of a switch. Every modulation setting can be controlled with their own separate speed, depth, and control parameters, used independently or mixed together to create some unique tone. In total there are 18 Total Effects to select from. With Stereo Inputs and Outputs it’s perfect for using in the mix with stereo effects or for sending the signal to two guitar amps. This pedal is not just for guitar or bass use the pedal with keyboards, synths or in the mix. You can also use the Vision as a traditional mono pedal in the effect chain, simply use the Left input/output only. Setting modulation times gets a whole lot easier with a built in Tap Tempo the modulation rates can be set perfectly. We had a vision to create the ultimate modulation pedal, the vision guitar effect pedal can be used by everyone from vintage rotary phase to psychedelic low bit stutter, this little box has everything covered. The JOYO Vision Dual Modulation guitar effect pedal is part of the R Series or ' Revolution' series of stomp boxes from JOYO. The Revolution series pedals all feature metal housed stomp box. The R Series are the 4th generation of pedals of JOYO and all feature some very cool ambient LED lighting. 'Off' - Okay, so Tron may not be your favourite and you want to stick to something a little less futuristic. The lights are off; the LED effect indicator comes on when you stomp on it and activate the pedal.